You've been counting the days down to this moment. The time has come to get out on the streets and go anywhere you want to go. And the Aerox 4 is waiting to open up a whole new world. Now anything is possible. Twist the throttle and the punchy 4-stroke, EU4-compliant engine gives you strong acceleration with outstanding economy. Its tubular frame and hydraulic forks deliver sports handling and precision cornering - while the lightweight 5-spoke aluminium wheels feature powerful 190 mm disc brakes for quick and easy stopping. With its supersport-style aerodynamic bodywork, this has got to be the coolest 50 cc scooter we've ever made. Life's a race. So get out there and win. 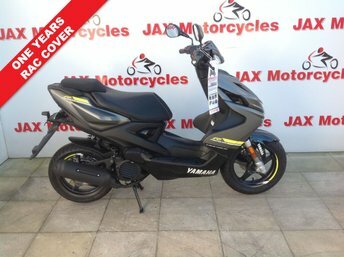 Get the best deal on a used Yamaha Aerox bike for sale in York by making your way to Jax Motorcycles today. You'll find every available model listed here on the website, and as all our stock is competitively priced you should have no problem sourcing a pre-owned Yamaha to suit your budget. Take the opportunity to browse our current range online before contacting a member of the showroom team to find out more. Our friendly and knowledgeable staff will be more than happy to answer any questions and provide advice and guidance when necessary. Alternatively, why not pay a visit to our showroom in person and take a closer look at the selection of used Yamaha Aerox bike models for sale.